15-Aug-2005 -- Do you know what heat is? Even on the ferry that brought us to the Limnos Island, on the highest deck of the ship, at the moment when the sun was rising, you feel like you are melting. “Melted” we got on the car and went to the first place we knew from the map. We were caring with us a rubber boat 3m/60cm with engine 4 h/p. It was one magnificent beach placed on one lonely bay not so far from Myrina. We made there our camp (free camping) on the beach. We met the sunset on our boat in the middle of the bay. Incredible. The peak Athon was in front of us on the scenery of the red sunset sky. Who should know that this red sky is a sign of high tides on the next day. Around ten o’clock on the next day we took our way to azimuth to the confluence waited for so long from us. Our speed was between 5 and 7 km/h with which we were getting closer and closer to the point. Moving along the coast we were watching the rocks and we were guessing what every rock looks like. It is our favourite game of imagination. 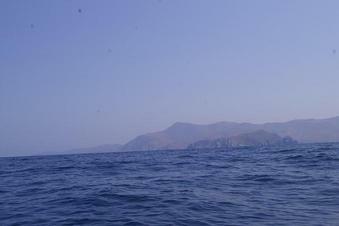 We passed by Medusa Gorgona, the rock where Prometheus were captured, but we stayed in the sea of heat. Only the big tides saved us from the hot weather, braking at the front of our boat and falling over us like a fountain. After four hours fighting with the big waves, we were very close to the point. The big ships which roads we crossed, tolerantly accepted our presence there. The confluence was made with a little wandering around. On the way back because of the high waves, half of the crew was suffering form the sea disease. The other half of the crew finished the bottle of whisky we had on board. In the sea, 4 km from the island of Límnos.